Go Take a Look on Your Own Time...No Broker Needed...Select "Want Name/Address" and Go Through The Easy Process! In escrow, although Backup Offers are being considered for this restaurant opportunity. Modern Quick Serve...Counter Service Japanese Cuisine with Poke Bar concept in Sacramento Area. This Restaurant is on a Well Traveled street and Beautiful retail center. This is an upscale newly built retail center catering to restaurants. There is ample parking, large comfortable and cozy seating with a beautiful Patio area containing a fireplace and a rentable banquet room for catering and events. The owners aren't selling the name and recipes..So bring your concept...can be same or similar concept or one that doesn't conflict with the other restaurants in the plaza. 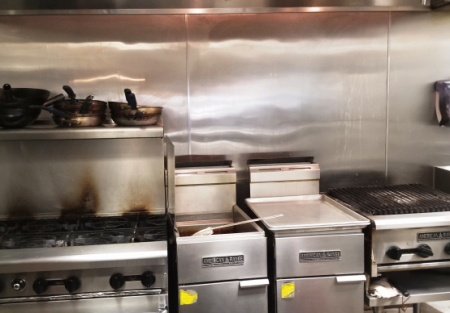 The sellers have too many other restaurants to mange currently, so this is your opportunity to get a incredible restaurant build out to add to your existing portfolio or start fresh with a superior space. The owners are very successful local restaurateurs and built this space out right and it wasn't cheap...Everything is like new and sellers have spent over over $300K on this Modern Japanese concept... Make this your Japanese restaurant yours for a fraction of the cost spent on build out. There is individual dining areas, but are conjoined with other restaurants in the Plaza which makes for a visually appealing atmosphere. This is a very nicely and professionally done restaurant. Lease $4,460.55 includes nnn for 1,925 sqft. Owner states sales around 40-60K per month as this is a new restaurant. Financials are not a condition of this sale as this will be a concept conversion. $125K gets you a beautiful restaurant and full Liquor license....there were incentives provided to the tenant in TI money, so Major FF&E will be yours at end of lease term. IF you want to come in with less money up front your can purchase for $50K and take over TI loan payments to landlord. In Escrow ....but seller looking for backup offers.